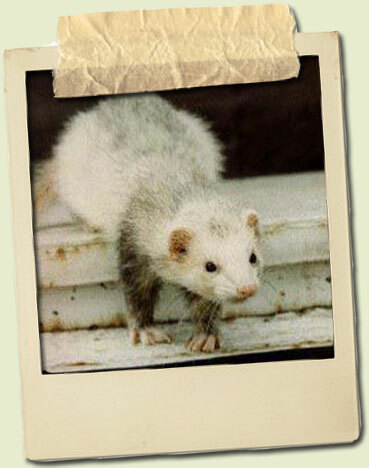 Who are the Web Ferrets? 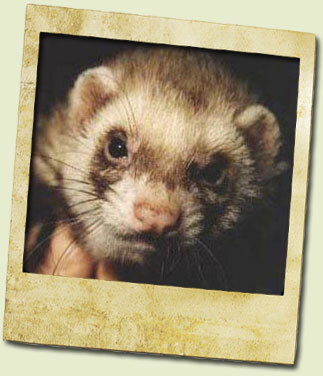 In the past 20 years, a number of ferrets came across our path (literally!) and we offered them a good home. Who were they and what was their character? How did they end up with us and how were they doing around the others? 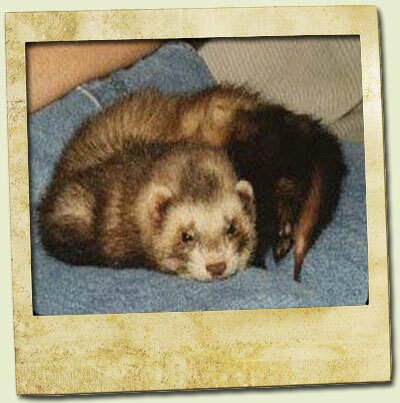 In this section I will introduce each of the ferrets starting with our very first one and ending with the three ferrets we currently have. About twenty years ago, driving home late at night on a deserted road just a couple of yards from our house, we almost ran over a strange animal. We didn't know what is was so I got out of the car to investigate. This animal, this furball was very interested in me and did not run away so we thought it had to be sick or at least injured. A passing neighbor, who was taking his dog for a walk, thought it could be a weasel or something like that. "Watch out" he yelled, "Those things jump at you and are very dangerous! They'll rip your throat right out!" Great, why must we find a sick throat-jumping weasel... Anyway, they had to do something. Meanwhile, the curious furball began to climb his way up to my pants. "He, leave me alone!" I screamed, thinking my end was near and that I would be found in a pool of blood with my throat ripped out! But none of this happened.... The little critter didn't do a thing when we managed to get him into a box and we drove home quickly. We called the Pet-ambulance to take this life-threatening thing out of our house. In the bright light of our kitchen we were able to take a good look at the 'beast' properly. It had a clean coat, no dirt or anything else and little eyes looked sharp and curiously into the kitchen. Finally the Pet-ambulance arrived. 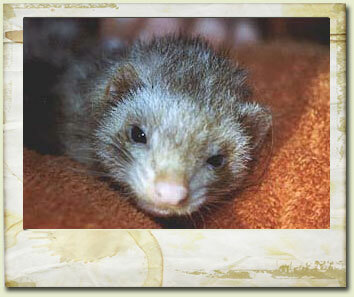 "Aaah, a little ferret" said the girl from the Pet-ambulance and she took the furball out of the box. She hugged him and it looked as if he liked that. "You can give him some dry cat-food" she said. Luckily we already had two cats... 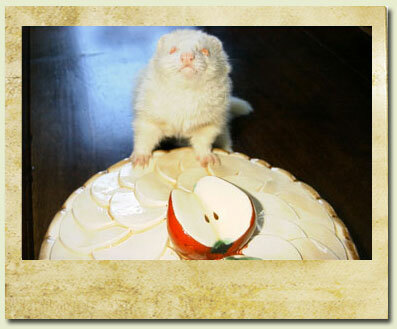 The ferret ate some food and began to investigate what would become his new home. "We can't take him with us because he is not sick or injured" said the girl. Oops, what to do now? 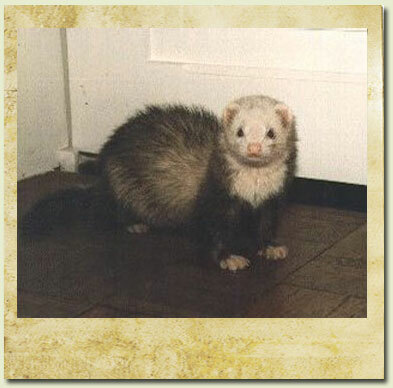 A ferret in the house... the house is not ferret-proof! PANIC!!!! The end of the story is that we never got rid of the little guy and a couple of days later we knew that we were totally in love with the little furball we named Hummel. After a couple of months we decided that Hummel needed a friend. Well, we got him one. Bobo was his name. A large, fat stinking ferret we got from somebody else. He was very dirty and the first thing they did was to put him in bath. Underneath all of that dirt emerged a very beautiful ferret! 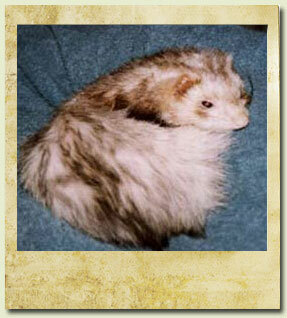 Bobo became a cute ferret, always strolling and shuffling through the house and was always near Hummel. They became best friends. Bobo is in Ferret-heaven right now. We named the guys Balu and Mowgli, one being a sweet big bear and the other a smart nosy rascal. They were always together and with this two ferrets started to see and learn the difference between sandy and wild color ferrets. Because we had our experience with Hummel (a sandy) and Bobo (a wild color) we noticed similar behavior with Mowgli and Balu. More and more it became obvious that sandies were more clever, nosier, more curious and that wild colors were just easy-going, sweet ferrets. That not all wild colors were like this, we would find out much later... Also the fact that they all were male ferrets we had have until then! Here is another picture of Mowgli and Balu. The story of Chewy is simple. Almost all the ferrets on this homepage come from the same shelter, except (much later) for Buffy and Sisko. 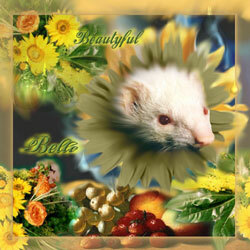 When we got Balu and Mowgli from that shelter we also noticed a very beautiful ferret who was almost selling his self. He laid there in his hammock and tried about everything to get our attention. We immediately fell in love but we came for two ferrets and not for three! When we took Mowgli and Balu in, Chewy was constant on our mind... After a couple of days we felt that he also deserved a chance on a better life. Well, the rest is history; just a week after Balu and Mowgli arrived here, Chewy followed. Any way, Chewy felt very comfortable with us. He also was the only one who loved laying on my wife's lap and being hugged and caressed. He was also very popular in their cage; all the other ferrets loved to sleep with, over, under or near him. Probably because his big belly gave them the warmth they liked so much. 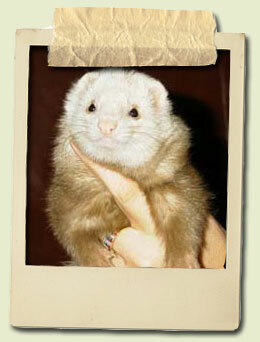 What I know now is that we were enormously lucky with this 'group' of ferrets. Another issue we would learn a lot about... The hard way! Understandably, Chewy is no longer with us but we often talk about him and about Mowgli and Balu as well. We had a lot of fun with those three guys and you can say that they made us ferret crazy for life. You can read all about it in the News-section. Here is another picture of Chewy. If, during the wildest moment of play, one of the guys attacked her (by accident or perhaps because Kira was in the wrong place at the wrong time), you could wait for her retribution... She would chase the villain all around the house and wouldn't stop before she could show him that she was not to be fooled around with! Often, we had to save one of the big guys from her. Not that she really hurting them or being aggressive to them but she just had to give them one or two firm snaps to let them know that she was the boss 'in tha house'. 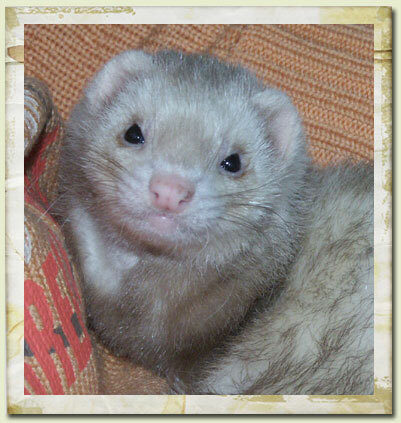 For us she was a very loveable and cute ferret and especially Marjan was very connected to her because this was the first female ferret. Much later Kira became ill and while she was under sedation for taking some blood it appeared that her body lost the battle and we could nothing else decide than to let her go. I wrote about this on our previous site and this was read by someone from Germany. She was so touched by this story that she decided to make a special gift for us. This gift was a total surprise for us and we are still thanking her for this enormous kindness. 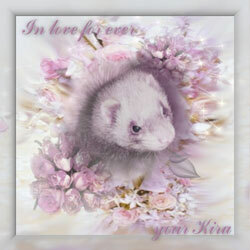 It is made by Suse and this is what she sent us, a special picture of Kira. 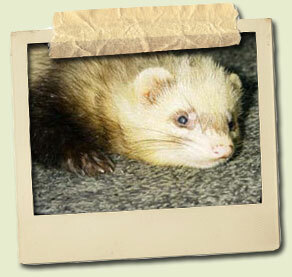 For more information on Suse, please visit her site Always Ferrets. During that time, we were still having very close contact with the shelter and one day we received a phone call. 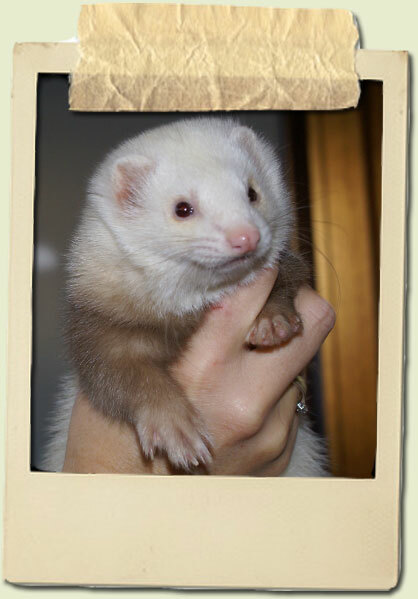 There was a small female ferret that was ready for a new home and if we had any interest. Of course we had place for another ferret but when we learned that she was an albino we became a little reluctant because albino's had red eyes! And there were more things like this that happened to her. She always kept us busy with her actions. 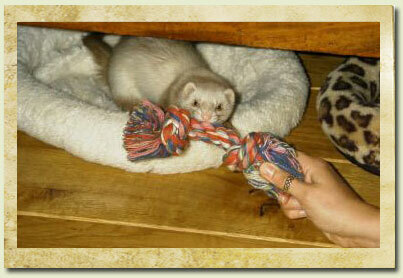 She was also very drawn to Marjan and she always did her thing alone and without the other ferrets. This sad story was again noticed by Suse (see Kira's story) and once again she surprised us with one of her unique compositions. The story of Marinka is kind of sad. She was a very tiny female and already 6 years old when we took her in. 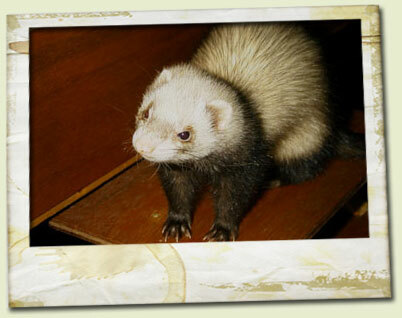 She also came from the shelter and they asked us to take care of her since we had more experience in older ferrets. Once in a lifetime, a ferret comes along that has such an impact on you.... 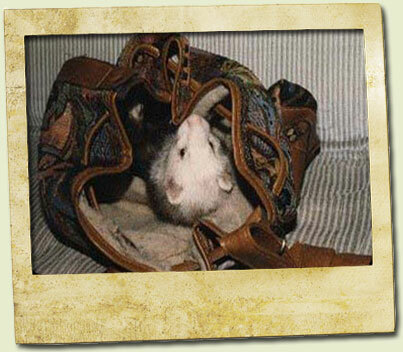 This was our beloved Buffy. One day we were visiting a gardenshop. In that shop was a separate department where they sold food for animals. They also sold animals, mostly rabbits, birds and fish but that one day.... they had a little cage with a very stressed sandy-colour ferret in it! The cage stood directly above another cage with some rabbits in it. Not quite as it is supposed to be. The ferret was very nervous and when we asked the shopassistant to take him out she refused to do so because the ferret was very aggressive and would bite. My wife ignored the story of the shopassistant and opened the cage... the ferret immediately bit her but she wouldn't let him go. We took a closer look and it turned out to be a female, a big female! We asked the assistant what they would do if they wouldn't sell her. She told us that the ferret would be brought back to the breeder to keep her himself. We could only speculate what he would do to her! Buffy became a very lovely ferret but made her the one that was so special you might ask... To begin with, she was very social towards us and the other ferrets. She also had the ability to look at you and understand what you were saying and she was very good in knowing what we were going to do. She often grabbed her chance only seconds when we had left the room! She was very fond of her toy, a big piece of rope with a knot at each end. We called it 'Buffy's rope'. Occasionally, we would hide it on a strange place and when she looked for it and found it she would hide it under the closet or she tried to drag you with rope and all underneath it! About two and a half years ago, Buffy became very ill. She was diagnosed with a liver disease caused by a inflammation that started in her stomach. Normally spoken this clinical picture causes a rapid death since the liver is a very important organ. 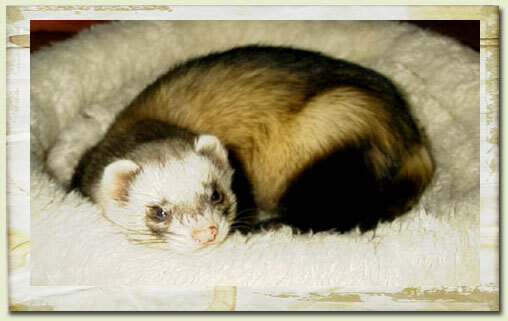 Thanks to the very best ferret vet in the Netherlands Buffy lived an almost normal life for two extra years. We had to administer medication three times a day and every three months we had to get back to the vet for a regular check on her situation. Luna came to us from (yes again) the same ferret shelter. When we picked her up she had a total yellow head and an almost bold tail. 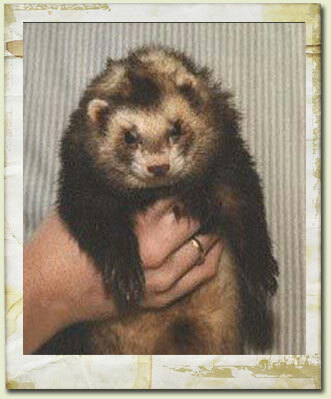 It was clear that this was a ferret that urgently needed proper care and food. 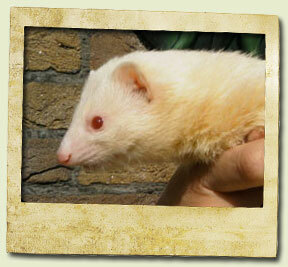 After a short time she became a beautiful albino with a good looking coat. 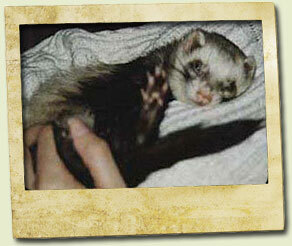 Luna was a bit of of a strange ferret and often we had the idea that she had a screw loose or something. She sometimes had a demonic look over her while on the other hand she wasn't. On the contrary, she was very cute and we laughed a lot with here crazy war dances. 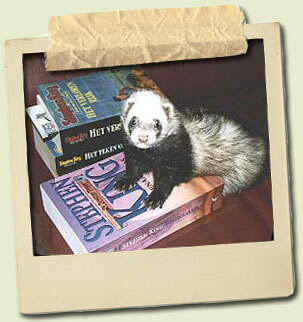 One day I read in the local newspaper that a ferret was found and was placed in a bird-shelter. 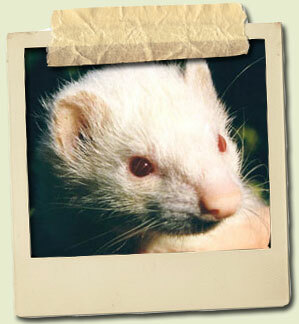 We called the shelter to ask about the ferret and if they were capable in housing a ferret. As you know ferrets need some special points to care of considering their housing. They replied that he was in good condition and they agreed that we could come over to visit him. When we arrived he turned out to be a giant guy in a steel cage with only some straw and some old newspapers! 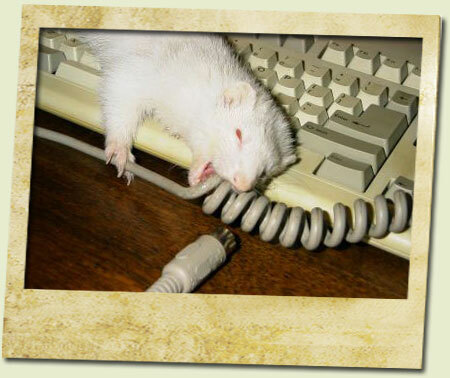 Apparently the people at the shelter tried to do their best but when it came to ferrets they had little knowledge. We told them how to change things and they let us clean his cage. We had brought some old hammocks and cushions from home and he really loved it! The next day we contacted the shelter again and proposed to them that we would take care of him until the rightful owner would turn up. Unfortunately they could not agree with that, the Dutch law forbids that found healthy animals are given away to others, even to take care of them. But they told us know that if the owner would not show up, they would be very happy if we took him in. We had to wait for about a week and then one day came the phone call; the owner never showed up, he was neutered in this past week and he was ready for a new start! We quickly drove to this shelter and took him home with us. He soon turned out to be the 'best friend' of the group. Every single one of them loved to crawl up his belly and fall asleep. He and Luna were always together and they became almost a couple. 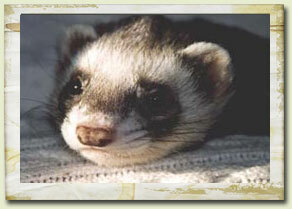 As you have read above, every ferret we have (had), is coming from a shelter except for Hummel and Buffy. Hummel crossed our path and Buffy was kinda fretnapped from a gardenshop. Although we are still very happy with all those fuzzies we wanted something else for once. 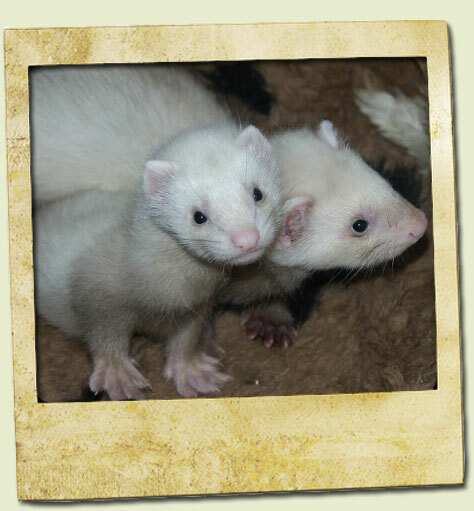 We felt it was time to start with two ferretpups and raise them from their birth and do everything exactly by the book to give them a perfect and healthy life. But since all of our ferrets were neutered how were we suppose to get pups? We knew that we had to look at some one else for pups and we searched the Internet for people that were breeding or had pups to offer. We also wanted that this person would know what they were doing and we were very selective in contacting people and informing about their way of breeding and knowledge of ferrets. 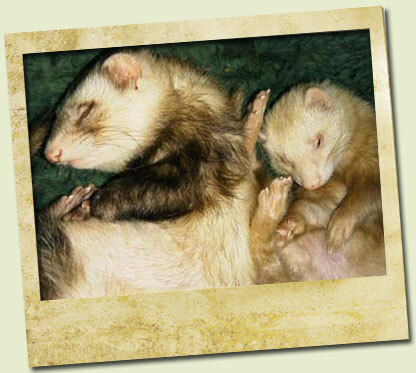 We didn't want any involvement in breeders who were after the 'exotic' animal such as Angora ferrets or any other variation of ferrets. 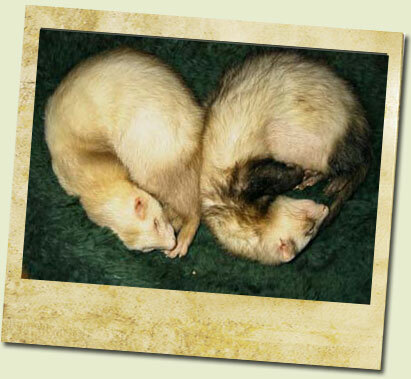 We also wanted two sandy ferrets, preferably from the same nest. A couple of weeks later she invited us to come over to her home and have a look at our two newborn fuzzies. Of course we accepted her offer and so one day we went. The pups were really cute and so adorable. Rebekka already had two pups picked out for us, a little female and a somewhat larger male. We immediately fell in love with those fuzzies! 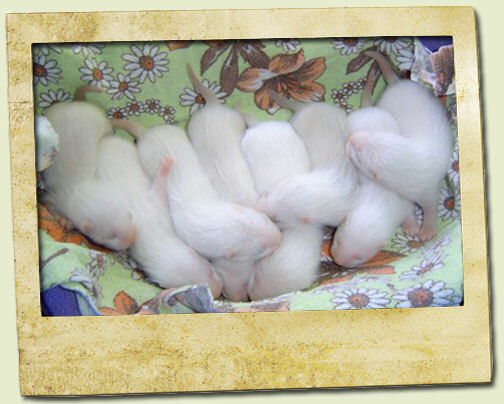 We had to wait until eight weeks were passed; that was the time that Rebekka felt the pups were grown enough to leave. Once again we headed over but this time we wouldn't leave empty handed :o). We named them Kai and Bo. The meaning of their names; 'Kai' is Hawaiian and means 'Ocean'. 'Bo' is Slavic and means 'Living'. All this happened about some three and a halve years ago and there are already a lot of pictures of Kai and Bo on our site. We are very happy with them and although they are relatives, we keep them separate. We allow them to play together but they each have their own cage, hammock, sleeping-bag and so on. When we learned that the mother of Kai and Bo was in desperate need of a new home we looked at each other. 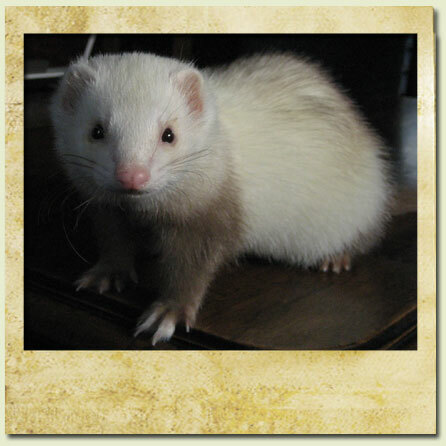 Marjan had already made up her mind and I tried to think of possible hurdles but when I saw a picture of Skunky I was lost... We are very fond of Sandy colored ferrets and Skunky is one of the most beautiful sandies we have ever seen. So we told Rebekka that we would be very happy and honored if we could give Skunky the home she deserved. Rebekka happily accepted our offer and so here she is; Skunky! She is so darn cute and beautiful! However, we noticed that she isn't really used to being picked up or being played with. This is meaning that we have to spent a lot of time with this little furball! No, not a cat.... but Cat! The story about Cat will follow soon.